COMMITMENT TO OUR COMMUNITY - Our volunteers are committed to providing quality patient care with true compassion. 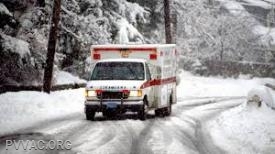 The Putnam Valley Ambulance Corps provides emergency medical services which is a totally volunteer-driven organization. We strive everyday to provide exceptional emergency medical service to the community. Everyone knows that some significant and potentially dangerous weather is heading our way tomorrow. We know there will be snow, ice, high-winds, and a good chance of power-outages. Congratulations to the Officers who will serve the Putnam Valley Volunteer Ambulance Corps in 2019. At the Corps' recent Installation Luncheon on Sunday, January 6th, all newly elected Officers were sworn in by Town Justice Gina Capone. The Putnam Valley Town Board, Volunteer Fire Department, and of course the Volunteer Ambulance Corps with its Youth Corps were well-represented. Youth Corps Skates in the New Year! The Youth Corps FINALLY got the chance to go ice skating! Congratulations to our members for a great year - and another one already underway! Are you between 14 and 18 and interested in learning some EMS skills, serving your community, and having fun? Consider joining us! To celebrate the end of our 2018 year, and to welcome in 2019, the PVVAC Youth Corps took to the ice for a day of ice skating, followed by a seasonal luncheon at Chet Pizza Hut. Note, due to the damp weather, some adjustments had to be made. As is the Youth Corp slogan - as is the slogan for all Emergency Services - "When in need, adapt!"